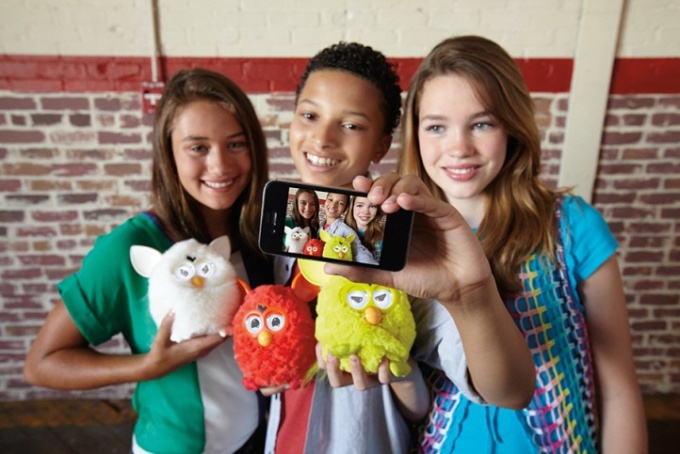 Furby – a great interactive toy that will become a perfect friend for any child. She is able to change character depending on how she communicate. Furby can do a good, evil, crazy Joker, the star of stage and back. All Furby initially identical and do not differ depending on the color. They can sing, dance, speak in their native language peruse, learn Russian words, respond to touch, eat, listen to music. When you first turn the Furby is pretty good. His eyes blink circles, hearts and birds. His voice is very gentle and he's happy and calm. He laughs and sings songs. To make Furby evil, you can, if you often feed him, pull the tail to turn. This version of the character of the Furby is that the sounds it emits become rough, appear in the eyes of the bombs and fire. He was laughing maniacally, shouting "lol" and may make inappropriate sounds. Furby to evil to do good, it must be ironed on the head, tickle baby tummy, gently talk to him. To make Furby crazy you can, if you shake it, flip it upside down, tickle and feed. In this mode, he will burp and fart and laugh. His eyes will spin and go in different directions. If the toy constantly play music, you can make Furby a star singer and dancer. His eyes appear mischievous touch, it will hum a merry song and dance to a lively tune. If Furby will be able to do good, evil, crazy, or a star, we can see how blink his half-closed eyes, hear the phrase "My change!" and meet the new character toys.